The Farm At Green Heron Pond’s New Honeymoon Cottage & Vacation Rental Getting Closer! The Farm at Green Heron Pond is excited to start offering a new feature in spring of 2019! The Cottage is a two bedroom, one bath vacation rental situated just steps from the onsite 1500 square foot pavilion. With magnificent views of the Green Heron Pond and the surrounding mountains, this new feature will be a great addition for onsite weddings and receptions, as well as travelers coming to the Asheville area wanting a unique overnight accommodation in a farm like setting. The addition of the cottage will be great for onsite weddings. Included in the day rental, wedding parties will have access to the additional covered space. It will also be available at a discounted rate to wedding couples for overnight stays prior to and on the day of their event. Adjacent to the Pavilion the cottage will be an ideal place for wedding parties to get ready before the wedding. With separate entrances to each bedroom (which can be used dressing rooms), brides & grooms will be able to get ready without seeing each until the wedding starts. Other features include a dressing area for the bride with a full-length mirror, petticoat stairs in the front for photos, an open living room/kitchen space for the wedding party to gather in before the ceremony. The cottage will also be available as a vacation rental for non-wedding/event dates. 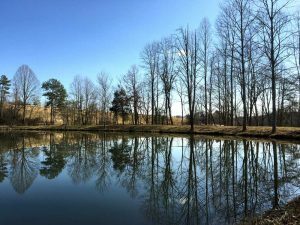 The Farm At Green Heron Pond is located in Leciester, NC just 20 minutes west of downtown Asheville and less than 10 minutes to the very popular West Asheville corridor. Situated on fifty acres of rolling pastures and woods the Farm At Green Heron Pond offers a serene, natural setting for weddings, receptions, parties, family reunions, picnics and other outdoor events. https://farmatgreenheronpond.com/wp-content/uploads/2019/02/CottageFront.jpg 750 1000 Farm at Green Heron Pond https://farmatgreenheronpond.com/wp-content/uploads/2017/05/logo.png Farm at Green Heron Pond2019-02-14 15:12:302019-02-14 15:12:30The Farm At Green Heron Pond's New Honeymoon Cottage & Vacation Rental Getting Closer!